Introducing Purex® Complete Crystals SoftenerTM*; a purer way to get laundry thatsmells clean and fresh for weeks. 92% natural, this product’s unique crystal form works differently than traditional oil-based softeners that coat fabrics with oily residue, because it infuses fibers with long-lasting fragrance. In addition, since you add it directly with your laundry, this means no more waiting for the rinse cycle, no messy residual gunk in your washing machine, and no more stains from spilling liquid fabric softener. I have to admit, I don't always add softener. Occasionally when I'm feeling particularly domestic I do....however, dryer sheets have always been easier for us. I don't have to remember to add softener during the wash cycle or buy a softener gadget of sorts to put the softener in....it's just easier. With everything that I have to do ton of different thing's in the coarse of a day (as do most mom's) and I'll be the first to admit that when I can simplify and make thing's easier, I do! So, as when I was offered the opportunity to check out the all new Purex Softener Crystals, as a member of the Purex Insider's.....I was intrigued to see what it was all about. A softener that is 92% Natural (HUGE PLUS FOR ME!) that could be added to the wash in the beginning of the wash cycle with the detergent? Sounded pretty neat! And it is! I simply measured and added a small amount of the Purex Crystals to the wash, and it dissolved quickly (although the crystals are different colors, they do NOT dye your clothes or leave residue behind in the washer, another plus!). After I transferred the load of laundry into the dryer, I was pleasantly surprised by the aroma coming from the laundry room, and even more so when I removed it from the dryer and all of the clothes were not only soft, but smelled incredibly fresh. I love that Purex Crystals doesn't dull the colors of our clothes! A definite new laundry essential in our home! 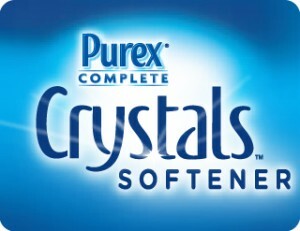 Experience the incredible difference with Purex Complete Crystals Softener! 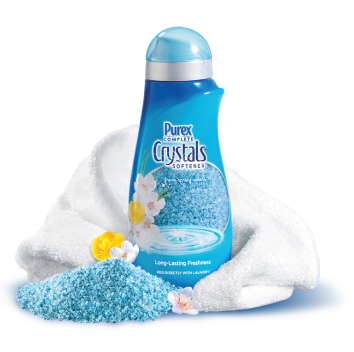 4 Lucky Reader's will each receive a full size bottle of the all new Purex Complete Crystals Softener! 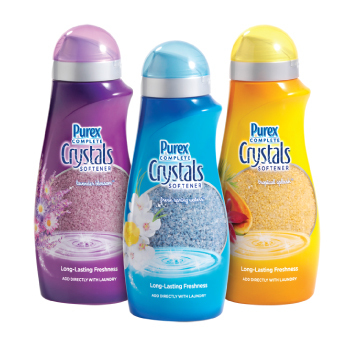 Leave a comment~ Why are you excited to try the all new Purex Complete Crystals Softener? The comment is considered your entry. 2) Tweet ~Softener REINVENTED! 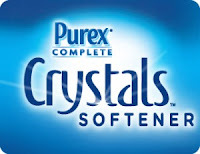 Purex Complete Crystals Softener! 4 WINNER'S! #WIN http://bit.ly/etMlu8 @savvycouponmom #Giveaway (can be repeated twice daily for additional entries~ copy paste please~cut and paste- the bit link must be posted in the tweet - I will check) (Additional 5 Entries - 5 Comments). I like how you add the crystals at the beginning of the wash cycle. kristiedonelson(at)gmail(dot)com Thank you. I like Purex on Facebook #1. kristiedonelson(at)gmail(dot)com Thank you. I like Purex on Facebook #2. kristiedonelson(at)gmail(dot)com Thank you. I like Purex on Facebook #3. kristiedonelson(at)gmail(dot)com Thank you. I like Purex on Facebook #4. kristiedonelson(at)gmail(dot)com Thank you. I like Purex on Facebook #5. kristiedonelson(at)gmail(dot)com Thank you. I like Purex on Facebook #6. kristiedonelson(at)gmail(dot)com Thank you. I like Purex on Facebook #7. kristiedonelson(at)gmail(dot)com Thank you. I like Purex on Facebook #8. kristiedonelson(at)gmail(dot)com Thank you. I like Purex on Facebook #9. kristiedonelson(at)gmail(dot)com Thank you. I like Purex on Facebook #10. kristiedonelson(at)gmail(dot)com Thank you. I follow Purex on Twitter #1. kristiedonelson(at)gmail(dot)com Thank you. I follow Purex on Twitter #2. kristiedonelson(at)gmail(dot)com Thank you. I follow Purex on Twitter #3. kristiedonelson(at)gmail(dot)com Thank you. I follow Purex on Twitter #4. kristiedonelson(at)gmail(dot)com Thank you. I follow Purex on Twitter #5. kristiedonelson(at)gmail(dot)com Thank you. I follow Purex on Twitter #6. kristiedonelson(at)gmail(dot)com Thank you. I follow Purex on Twitter #7. kristiedonelson(at)gmail(dot)com Thank you. I follow Purex on Twitter #8. kristiedonelson(at)gmail(dot)com Thank you. I follow Purex on Twitter #9. kristiedonelson(at)gmail(dot)com Thank you. I follow Purex on Twitter #10. kristiedonelson(at)gmail(dot)com Thank you. I follow with RSS Feed (Google Reader) #1. kristiedonelson(at)gmail(dot)com Thank you. I follow with RSS Feed (Google Reader) #2. kristiedonelson(at)gmail(dot)com Thank you. I follow with RSS Feed (Google Reader) #3. kristiedonelson(at)gmail(dot)com Thank you. I follow with RSS Feed (Google Reader) #4. kristiedonelson(at)gmail(dot)com Thank you. I follow with RSS Feed (Google Reader) #5. kristiedonelson(at)gmail(dot)com Thank you. purex is my fav and anything they put out i would love to try! I'm excited to try it because I love that it's 92% natural and I would really like my clothes to smell fresh. We purchased a 65 yr old home last spring and totally gutting it and remodeling it. It has well water which is hard and leaves our whites yellowed at times..would love to try this so my whites stay white & bright. I am excited that it protects and preserves your clothing! I would love to try this because I can add it in the beginning instead of forgetting to add my softner at the rinse cycle. Plus I like that the scent lasts a long time. A softener that doesn't disturb the fire retardant in kids pjs is really cool - and to get everything done in the washer is really convenient! #1 - Also entered the Udderly Smooth Giveaway! #2 - Also entered the Udderly Smooth Giveaway! #3 - Also entered the Udderly Smooth giveaway! #4 - Also entered the Udderly Smooth giveaway! #5 - Also entered the Udderly Smooth giveaway! I am so excited to try it because of the fact that it is made with 92% natural ingredients. I'm excited to try these because it's a great way to add softness to my laundry without affecting the fabric! Clothing is expensive, so keeping the fabric in good shape and looking great is important to me.